This was MEA’s first published book, although she did write several before it which didn’t see the light of day. It was written in 1939 and accepted for publication by Black, but was then sent back in 1940 due to ‘the changed circumstances of war’ (MEA – To Be An Author). In 1945 she sent it to Warne, who offered to buy it for £30 outright, which as she says was dreadful even for the time, but she was beside herself with joy at finally having a book accepted, and it was finally published in 1948. 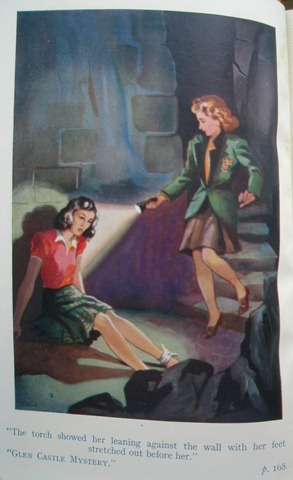 The publishers changed the title without MEA’s consent – her title was Grim Glen Castle. 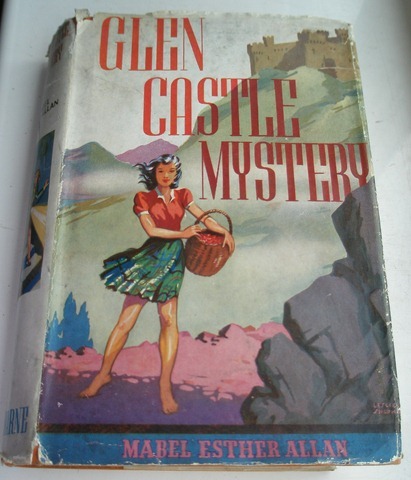 …shock number two was the jacket design, with the castle on a hill, not deep in the glen, and Bride MacRanald looking much too old and more like a stylised gipsy (a stage one) than a Highland child. What is it that makes illustrators visualise Highland or Hebridean young people in this stagey way? Furthermore the spine had a horrid picture on it, and the frontispiece was awful. The story opens with Annabelle, Walter and Pie meeting family friend Parrot from the station, much to their disgust, as she is seen as wet and unadventurous. She is an orphan who spends part of each holidays with them, her father was a friend of Mr Denton. On their arrival home they hear that a distant relation of Mrs Denton’s, Uncle Donald MacRanald, has died and left his castle, Glenn Dorcha, to Walter, as his estranged son has died abroad. Mrs Denton visited the castle in her younger days, and rechristened it Grim Glen Castle, being unable to pronounce the Gaelic. Soon after they arrive at the castle, Parrot and Pie go missing, and are found in a room with lots of shrouded furniture, apart from one chair which is arranged to look directly at one of the oil paintings. When they return later the chair is under covers once more. Later they play with some of the broadswords, but when they return they have been put back in their rightful places. The only other dwelling nearby is ‘More Farm’, which is inhabited by Mrs Glennie, five children – Bride, Maire, Morag, Colin and Calum – and a ‘lady writer’ who is staying with them, to help out with household expenses. The Denton children would like to be friendly, especially with Bride, but she will not speak to them. Later Parrot falls off her bike and Bride sends one of the younger girls with a damp handkerchief to bandage her injured knee, and this is the beginning of a secret friendship between the two. Bride is kinder to Parrot than the Dentons are, and Parrot gains confidence, this is further boosted when Bride shows her a secret passage from the glen to the drawing room of the castle – no one else knows about this apart from the old housekeeper, who has gone to stay with her sister on Skye. The next adventure is Walter and Annabelle’s attempt to climb Beinn Fraoch, the nearest mountain, because they have heard that the Glennies have climbed it. They reach the top, but as they descend the mists come down, and eventually Bride rescues them, but she is still not friendly, and disappears as soon as they are safely down. A few days later the inhabitants of the castle are disturbed late at night by Mrs Glennie, as Bride is missing. Search parties are sent round the glen, but there is no trace of her. Then the Glennie’s guest arrives, and tells them that she is Bride’s mother, and that she was the wife of Donald MacRanald’s son, Revie. Eventually Parrot remembers the secret passage and finds Bride there with a badly twisted ankle. On hearing that Bride is Revie’s daughter, Walter immediately declares that the castle should belong to her, and that he is going to give it to her. His family do not demur, and the rest of the holiday is spent making friends. Bride returns south with the Dentons and Parrot, for a fortnight’s holiday, and they plan to spend summer holidays at the castle. The book opens at the Dentons’ house (Orchard Gate) in Silverthorpe. The exact location isn’t given, but the family catch the train from King’s Cross to go north, so presumably it is in the south of England. The castle is three miles from ‘Ardglen’, which MEA states in ‘The Background Came First’ is Glenelg, on the Sound of Sleat, opposite Skye, a favourite place of hers. Buntawe is also mentioned as a local town, from which clothes can be purchased, and where there is a good girls’ school, which Bride will attend. The journey from London to Ardglen is made first by train, then by boat – the interchange point is not named. MEA was influenced by the writing of Elsie J Oxenham, and this book has overtones of The Girl Who Wouldn’t Make Friends, with the ‘rightful heir’ being unfriendly to the new (youthful) owner. It’s a much more simplistic story though, and the easy way in which the ownership of the castle is given to Bride is at odds with EJO’s insistence that Robin has to be of age before she can give even part of her property away. This feels very much like an early book, there are plenty of odd paragraphs which don’t add much to the story, or promise later revelations which don’t come to anything, but it’s a competent story for all that. Parrot reappears as a pupil at Bryngarth School in New Schools for Old. Bride is mentioned as living in the castle, the Dentons are referred to as her adopted cousins. Walter and Annabelle reappear in The Secret Valley, they mention Parrot a couple of times, although they do not refer to her by name.